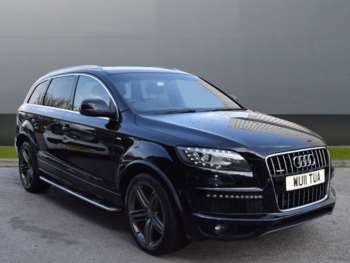 RAC Cars boasts an impressive range of used Audi Q7s on the used car market. This popular large 4x4 is powerful and stylish, making it a great choice for those looking for a high-quality, practical and ultra-stylish Audi model. Because of the class of this luxury model, it often comes with a hefty price tag, but, buying a used model is a great way to get all that style, for a much smaller price. So, if you’re looking for a luxury 4x4 that you can be proud of parked on your drive, look no further than the range here at RAC Cars. Used Audis have a reputation for being reliable cars, so you can certainly expect something sturdy with a high build quality. You can also enjoy a large 4x4 with lots of space that doesn’t compromise on style. Technically a capable car, you’ll also be getting a high driving position and a car that won’t let you down. The Audi Q7 is a soft and comfortable drive that is great for cruising and very relaxing. A plush vehicle, with plenty of finishing touches, makes for an easy drive too and with luxurious materials to top it off, you can just sit back and enjoy the drive. Discover what offers on second-hand Audi Q7s we have to offer at RAC Cars.